In my industry, there are many layers of people that participate in making my business a success. Of course, there are all my supportive customers. There are my family and friends, there is me. And, there are the wonderfully underappreciated show promoters, market managers and the like. They are the behind the scenes people who constantly and consistently toil away to create a successful show, for both the vendors and the clients. What most folks forget is that this relentless, hidden force is usually headed by a creative individual, that got into the role of organizing shows from the position of being in shows. These people are often talented multi taskers that excel not only in the diplomatic running of markets, but in producing artwork or craft that is just as successful. Jessica Blaszczak is one of this ambidextrous people. Jessica is one of the best market managers that I have had the pleasure of working with AND she creates fun, functional, affordable craft. 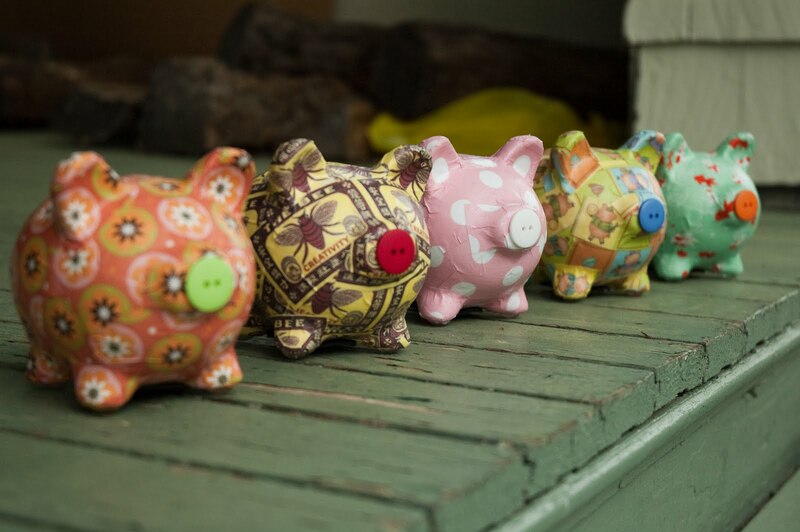 This Little Piggy is simply decoupaged piggy banks, created one at a time, to bring smiles to little and big two legged piggies. Read on to find out why Jessica is always smiling! A~ Well, started with art in general? Always ... since I could cold a pencil. 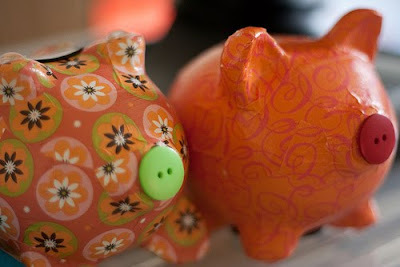 With decoupage, I remember going into Anthropologie (LOVE that store!) and I saw a decoupage tea pot for $200. I thought, like most people do when they see a decoupage teapot, hey, I wanna do that. And I did. And it was fun. And I got to use my love of paper to make something useful and pretty. 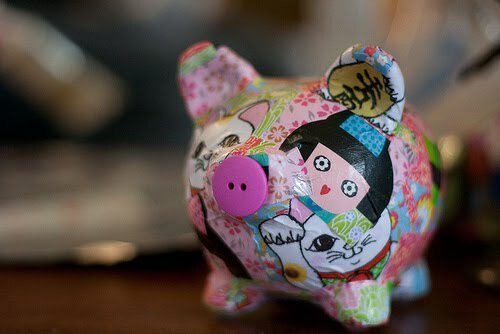 So, from there, I basically combined my two loves: art and animals and got decoupaged piggy banks. A~Okay. This is kinda cool. Homeward Trails, a local Arlington animal rescue organization, holds a charity art auction each year called PawCasso. 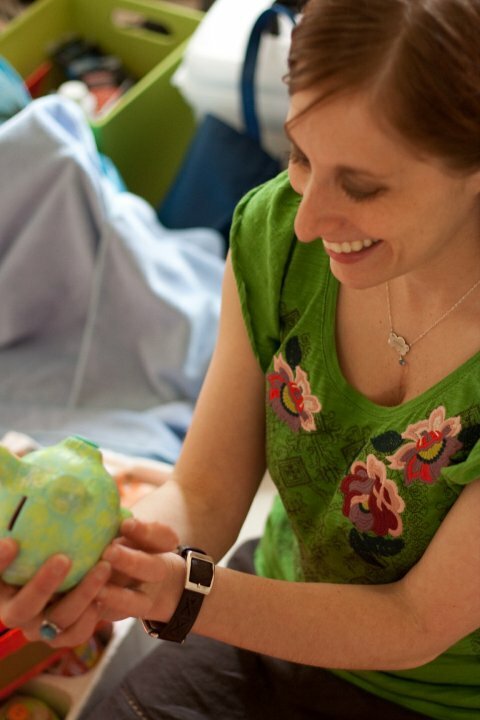 I donated a large-sized cat-themed piggy bank to the live auction, which usually goes for around $75. I didn't really expect it to go for much because they was a lot of killer art there. Anyway, they started the bidding at $20 and someone bid. Then, another person bid. Then another. And then there was actually a bidding war! The Kitty Piggy went for about $130. And 100% of the proceeds went to Homeward Trails. That's a lot of dog food! Yep, that was pretty awesome. A~All around me. Literally. I manage a local art market, The Ballston Arts & Crafts Market, and I help out with the Fenton Street Market, so I'm lucky to have the opportunity to work with talented artists all the time. So, really, art in general inspires me. But I also find inspiration in my friends, my coworkers, my husband, my pets. I'm surrounded by beautiful things. I think we all are. A~I think with art, you get a glimpse into someone's personality. Into their complicated minds without being intrusive or questioning. And when someone buys one of your pieces, it resonates with them, and some sort of connection is created. You get a glimpse into their personality, too. Art is personal. It's fun. It's fulfilling. And, I think the piggies make people smile. It's always nice to make other people smile. A~The Ballston Arts & Crafts Market is my favorite show, of course! Check out the blog (shameless plug)! A~I get to make piggy banks in my spare time. What's not to love? Special orders are fun, too! A~I'd like to be able to go further with it ... maybe branch out a bit. It would be cool to see my piggies in a boutique store as popular as Free People. But I have a lot of work to do before I can even entertain that idea. A~To have fun. That's it. That's my mission. A~Ooooo ... good question. My two favorite US cities are Charleston, North Carolina & Seattle, Washington. Very cool cities for very different reasons. A~Well, piggy bank-making isn't my full-time job. I'm an event coordinator and a freelance writer, so ... I also love to paint and sculpt. I like to make these cute, little art dolls that are also kid-friendly. A~What's your sign? Seriously! I love astrology! Meet Jessica and her piggies in person at Cocktails and Craft, a happy hour party type thing, where you can buy all your holiday gifts and have fun too. It is TOMORROW night, Saturday, November 6, 5-9:30pm, at 3213 Kinross Circle, Oak Hill, VA 20171. Also, future shows can be found on Jess' website at www.thislittlepiggymarket.net. Likewise this weekend, I'll be gearing up for major holiday shopping to start! Don't wait until the last minute like every year! Start early for the best selection! I will be at two markets this weekend for you to kick start your holiday shopping! Jessica is so awesome that I spontaneously hugged her at one of the shows. Normally, me hugging anyone would open a rift in the time and space continuum, but because Jess is the wonderful person she is, everyone was safe. She is also the only person that has made me look forward to doing a show.